I’ve had great success in the garden this season with a bounty of beautiful, round firm cabbages that I nurtured from seed. Normally they’d be ravaged by various insects, but I planted them earlier this year to get ahead of the aphids and caterpillars, which don’t arrive until the warmer weather. I find it a wonder that such a beautiful thing can grow from a tiny seed. I’ve been eating sautéed cabbage, coleslaw and experimenting with making sauerkraut. Now I have turned to cabbage rolls. 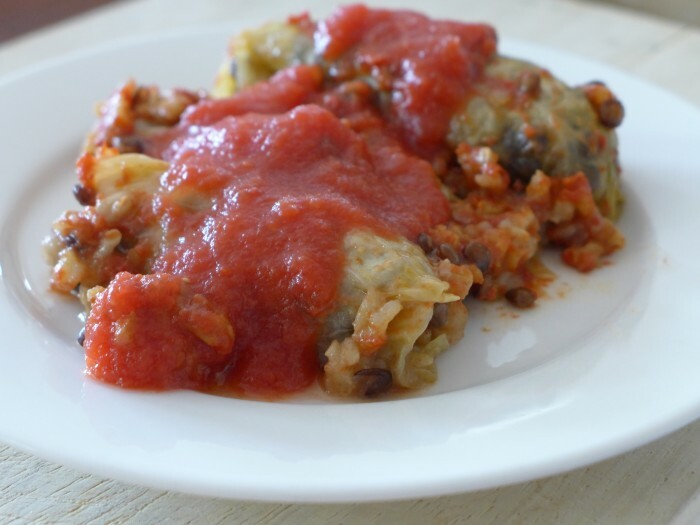 Normally cabbage rolls would be a winter dish for me, made using bought cabbages. 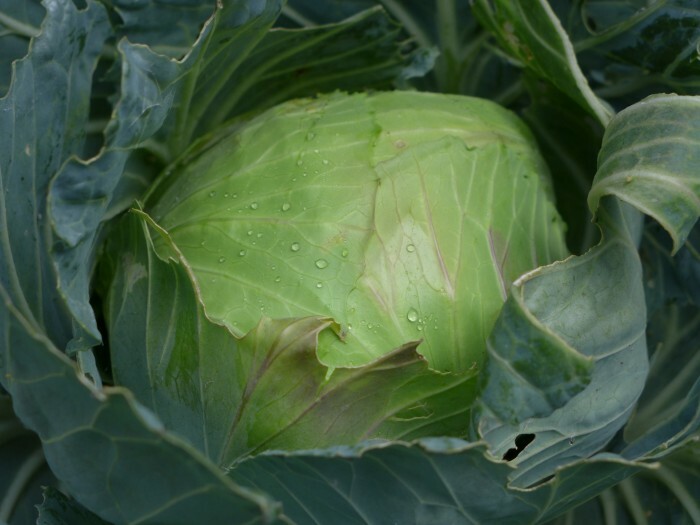 But with an abundance of home grown late spring cabbages, a spate of strange cold weather and a potluck birthday dinner to cater for, they seemed just destined to be made. They are stuffed with small french lentils and rice cooked with lots of onions, porcini mushrooms and stock and then baked in a tomato sauce. I like the small french green puy type lentils because they retain their shape when cooked and the filling ends up with good texture rather than just mush. The rolls were good on the day they were made, and even more flavourful on the next day. I love cooking from the garden and this dish used both the cabbages and some tomatoes I bottled from last season. Add the raw rice and lentils to the pan, crumble the porcini mushrooms, stir and add enough stock to cover by 1 cm. Bring to the boil, turn the heat down to the lowest setting, cover and cook until the rice and lentils are just tender and the liquid is absorbed. You may need to add more stock or water. Don't overcook, they will cook a bit more in the tomato sauce later. Stir through the lemon zest and parsley. Add the tomatoes, crush and cook until reduced slightly. Season with salt to taste, and if needed add a small amount of sugar if the tomatoes are a bit too acidic. Take the leaves and submerge them in boiling water until they are limp. Lay the leaves flat and add filling to the leaf closer to the stem end. Roll the leaf tightly, folding in the sides as you go and folding over again. Place the rolls seam side down into a baking dish. Don't worry if the are a bit messy or the filling is spilling out. When they are packed together and baked they will stay intact. Pour the tomato sauce over the rolls, cover with foil and bake for 45 minutes at 180 dec C.
Check them once or twice during cooking and if they look dry pour in a little stock to keep moist. They sound great – I love the idea of cabbage rolls but when it comes to making them I quiver at all the fiddliness! I did once make a whole stuffed cabbage which gets around the rolling up each roll but before my blogging days. To be honest, normally I can’t be bothered stuffing things. But these are very forgiving. It doesn’t really matter if the ends are open because they are packed in pretty well and the sauce isn’t very wet. Mine were all shapes and sizes. The filling was already cooked so the last bake is just to cook the cabbage. I think they’d even work layered. Tomatoes, leaves, filling, leaves, tomato/stock, bake. I might give that a go seeing as I have PLENTY of cabbage left!